A Look At WWE's Live Attendance Decline, How WWE Can Turn Things Around - Wrestling Inc. Following WWE's Q3 earnings report in October, Vince McMahon addressed concerns about WWE's declining live attendance by telling investors that the company was aware of the issue and had a solution. "Live events always has been a barometer as to how well we're doing," McMahon said, "Notwithstanding that, we throw around this word 're-imagine' a lot. But we know what's wrong with our live events, and it's somewhat of a-- I don't necessarily want to call it [an] antiquated presentation but we know to fix things. If something's wrong and you don't know how to fix things, you're in trouble. We know how to fix that, and we'll be re-imagining those live events very, very shortly. We'll see a pretty good turnaround I think in short order." McMahon said that they knew how to fix things, but failed to elaborate on how WWE was exactly planning on doing that. Last Thursday morning, WWE revealed its Q4 results and the declining trend in live event attendance continued, showing that whatever solutions McMahon had in mind to fix live attendance, they have not yet proven to be effective. Live event attendance in North America was down 7% from an average of 5,400 fans per show to 5,000 fans per show over last year in Q4. That comes on the heels of a similar decline in Q3, when live attendance declined 8% from 4,900 fans to 4,500 fans over the last year. There were similar declines in both Q1 and Q2 as well. WWE Co-President George Barrios addressed this issue on Thursday, saying that while live attendance is down, he pointed out that attendance for televised shows remains stable. "Over the past decade, total annual attendance at our North American events and revenues from ticket sales of those events as followed steadily increasing trend line," Barrios told investors. "Second, of the 310 main roster Raw and SmackDown events in 2018, only a 113 of those were events where we created video content and monetize that media to content rights fees, first part of our WWE Network subscription service. 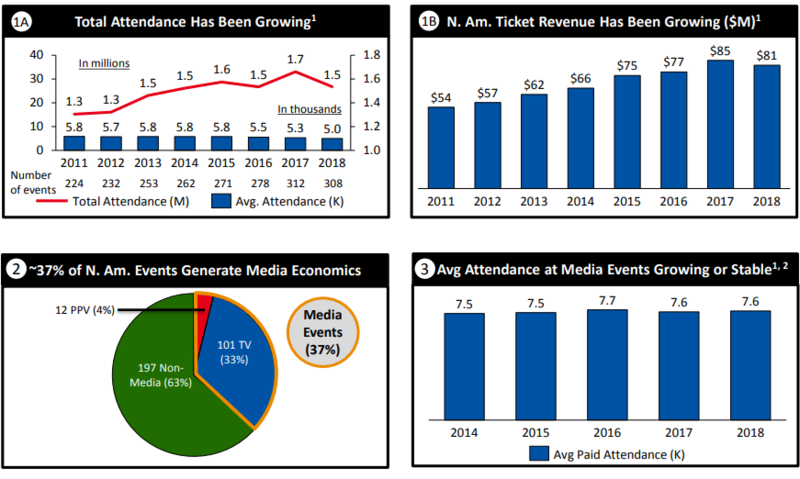 And finally for those 113 events where we created and monetize video content, our 'TV and pay-per-view event', average attendance has generally been growing are stable." Barrios said something similar when he was questioned about WWE's live attendance decline on CNBC's "Closing Bell" on Thursday. "We ran 320 or so live events, and 113 we created media, RAW and SmackDown and the PPV events you see on the WWE Network. At those events, whether you are there live or watching at home, it's really about energizing the crowd," Barrios said. Barrios then joked with Closing Bell anchor Sara Eisen when she said that she hadn't been to a show lately, saying "Well you have to go, if you went to one you wouldn't even be asking me this question." Barrios' statement that televised shows are holding steady may give some investors relief, but it does not change the fact that in general, WWE is experiencing consistent, monthly decline in live attendance. Vince McMahon did take a stab at addressing the attendance issue on Thursday, blaming injuries to key talent. "The unfortunate aspect of sometimes in our business, is that our performers are not cartoons. They get hurt. This year, leading up to where we are now, we've had an inordinate number of injuries," McMahon said. "And when you have injuries, there's a whole bunch of them. Roman Reigns being the principle among them. McMahon also mentioned other names, such as Seth Rollins, Becky Lynch and Braun Strowman as key talent that have also missed time recently. However, McMahon's explanation does not explain the year-long trend in declining live attendance. Reigns being off of WWE shows in Q4 may have hurt that quarter's attendance, but during Q2, when Reigns was the most pushed guy in the company, attendance declined at the exact same rate as Q4, going from 5,500 fans per show in 2017 to 5,000 fans per show in 2018. Despite WWE's attempts to excuse its decline in live attendance, it's clear that the company is having problems attracting fans to live shows. Why is that? The obvious explanation is that as evidenced by declining viewership, WWE just has less fans in general than they have had in the past. With fewer fans watching the show, there are less fans willing to go to live events. Additional problems could also be a lack of a real, major drawing card. While some wrestlers in WWE are more popular than others, no full-time star has proven to be a major individual driver of business. The shows that feature John Cena and Brock Lesnar tend to do better, but again as evidenced by weekly viewership numbers, performers like Rollins, Lynch, AJ Styles and Daniel Bryan don't have a clear and obvious impact on increasing live attendance. Another explanation could be that fans have been conditioned to disregard house shows. Most fans understand that since the matches are not televised, nothing of real consequence is going to take place. Titles are not going to change hands and storylines are not going to be advanced, so house shows often lack a sense of importance. Not helping matters is that Brock Lesnar does not work many house shows, and since he has been the Universal Champion for a majority of the last couple of years, WWE has not had it's world title on the road for RAW house shows. In that same vein, it's possible that WWE consistently advertising wrestlers who do not end up appearing on house shows is causing fans to lose interest in attending. At the beginning of the month, WWE advertised both Styles and Lynch for SmackDown shows in the Pacific Northwest, and neither of them ended up appearing on the weekend shows. Styles was out with an undisclosed injury, but Lynch missed the shows allegedly to sell her knee injury, which may have prevented her from wrestling, but would not prevent her from making an appearance on the show. With SmackDown already without it's top male babyface, WWE still decided to take it's top female babyface off the road as well. That kind of consistent behavior drives fans away; even the most loyal supporters will stop attending every show if they get burned a few times. A short-term solution to picking up live attendance is to just start taking the shows more seriously. Fans need to feel like the shows are important, so WWE needs to throw in some matches of consequence, either by changing a title or two, or throwing in stipulations that will affect the next episode of RAW or SmackDown. WWE needs to avoid advertising wrestlers for shows they know are not appearing on the live shows so fans are not disappointed when they don't appear. Thanks to increasing TV contracts and a lucrative deal with the Saudi Arabian government, WWE is in great financial shape even with declining house show attendance. However, the declining viewership and declining live attendance does indicate that WWE is becoming increasingly less popular with fans. Over the next few years, WWE's TV contracts will provide the company with plenty of financial support; but if there fanbase continues to decline, WWE will have serious long-term issues.